University of Hawaii astronomers report their discovery of 11 satellites of Jupiter, all members of Jupiter's outer "irregular" satellite system. These observations double the number of such moons known to orbit the planet and are the largest number of satellites ever discovered at one time. Ten of the discoveries were announced today on International Astronomical Union Circular IAUC 7555. The 11th was announced at the end of November on IAUC 7525. 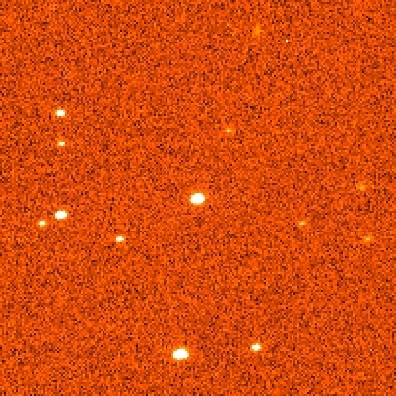 The satellites were discovered during a systematic search of the space near Jupiter conducted at the University of Hawaii 88 inch (2.2 meter) telescope atop Mauna Kea. We employed a large format charge-coupled device (CCD) camera (the "8K") to obtain a wide field of view. The CCD produces digital images that can be conveniently analysed using computers. Our strategy was to obtain 3 images of each position in order to search for objects moving against the star and galaxy background. Objects near Jupiter move with a characteristic slow speed that helps us to distinguish them from foreground asteroids and background Kuiper Belt Objects. 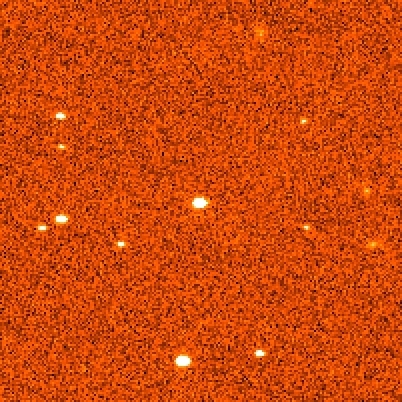 As an example, Figure 1 above shows three images of 2000 J8 taken on UT 2000 Dec 05 at the UH telescope, assembled to show the motion of the object relative to the background stars and galaxies. The images were taken at 08:35, 09:09 and 09:48 UT. The satellite moves towards the West (left) in these images. North is towards the top and the field of view is approximately 70 arcseconds by 70 arcseconds. The images are compiled into a small movie (270kByte). 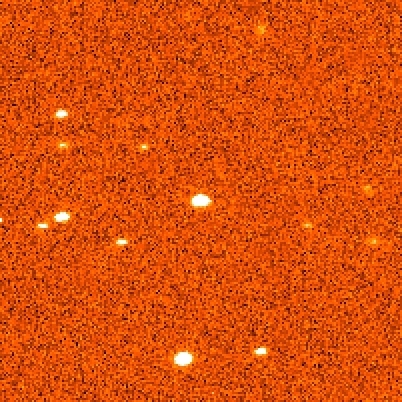 One of the 11 satellites turns out to have been a previously observed but long-lost object S/2000 J1. The other 10 have not been previously seen. The sizes of the satellites are not well known because their albedos (the surface reflectivities) are unmeasured. However, crude estimates based on the apparent brightnesses in our data and on an assumed albedo of 4 % place the diameters in the range 3 to 8 km. Because the albedos are probably not less than 4%, the sizes are probably not larger than those obtained here. The estimated sizes are summarised in Table 1. The eleven satellites follow "irregular orbits", meaning that their orbits are large, eccentric and inclined to Jupiter's equator, as can be seen in Figure 2. Table 2 shows the orbital information for the 11 satellites. Another nice site with orbit diagrams and orbital element information may be found at Project Pluto. Satellites S/2000 J2 - J10 have orbital radii about 300 times the radius of Jupiter and inclinations near 150 to 160 degrees, meaning that they are retrograde. These objects join the 5 previously known retrograde satellites of Jupiter, bringing the total number of such objects to 14. Satellite S/2000 J11 falls in the prograde irregular group, with orbital radii near 150 Jupiter radii and inclinations near 30 degrees. A total of 5 such objects are now known. Lastly, S/2000 J1 occupies neither of the previously known dynamical clusters, with orbital radius near 100 Jupiter radii and inclination 45 degrees. Irregular satellites are thought to have been captured from heliocentric orbit when Jupiter was young. The best evidence for capture is that the orbits of some of the irregular moons are actually retrograde (meaning, they orbit the planet in a direction opposite to Jupiter's rotation). Essentially the only plausible way to produce irregular satellites is by capture. However, it is not easy for Jupiter (or any other planet) to directly capture passing asteroids from heliocentric orbit. In general, some of the initial energy of the heliocentric objects must be dissipated so that Jupiter can hold on to them. The origin of the dissipation that lead to the capture of Jupiter's irregular satellites is unknown. In fact, at the present time there is no plausible source of dissipation so that capturing satellites is presently almost impossible. It is theorized, however, that the youthful Jupiter sustained a bloated atmosphere that extended far above the cloud tops of the present planet. Friction with this atmosphere could have captured the irregular satellites. In possible support of this hypothesis, we note that most of the satellites belong to dynamical groups or "families" with similar semi-major axes and inclinations. Perhaps these families were formed when initial bodies broke up on capture, due to the pressure exerted by impact with the extended atmosphere.